One of the highest graded examples in existence of Action Comics #1, which features the first appearance of SuperMan, sold at auction this weekend for an unprecedented, $317,200. Only 100 or so copies are know to exist of this issue which is described by collector's as the Holy Grail of comic books. 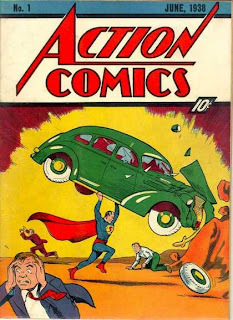 The winning bid for the 1938 edition of Action Comics No 1 was submitted by John Dolmayan, the drummer for the rock band System Of A Down who is also a dealer in rare comics. The previous and orginal owner acquired the comic back in the 1950's at the age of nine from a used book store for the paltry sum of . . . . $0.35c. Comics are insane! Here is a crazy story. Back in the 50's, my brother would go out and trap gophers to earn spending money for his comic books. The rest of us kids thought it was stupid to spend all his money on comics. It has been 15 or so years ago, but he pulled the box of comics out of storage only to find many had been destroyed. However, the sale of only three paid for a brand new truck! Who's stupid now! Wow that is a crazy story.